With the Yamaha CLP-535, you can choose from two, world-renowned concert grand pianos: the Yamaha CFX and the Bosendorfer Imperial. The new GH3X keyboard with synthetic ivory keytops features an escapement mechanism which reproduces the depth resistance characteristic of a grand piano along with improved key return and response. 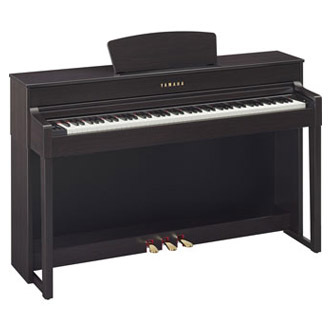 The CLP-535 offers 256-note polyphony, 16-track recording, a USB Audio Recorder and over 300 exercises for building piano technique from Hanon, Bayer, Czerny and Burgmuller. You can also connect your iPhone, iPad or iPod touch wirelessly! *The CLP-535 is also available in Polished Ebony, Dark Rosewood, Mahogany and White.